Understanding more about language development can help us teachers and parents have a clearer picture on our role in facilitating it. Sometimes, our expectations are too high or sometimes we neglect some problems in language development children might have. Most of the time, language acquisition is something natural which just unfolds without too much effort from parents. If children are stimulated, however, that can be a different story. The vocabulary could be even richer, the healthy habit of reading might be developed and the child may ultimately learn to express him/herself much easier. All these have major implications for the child's future adulthood, form both career or personal life perspectives. 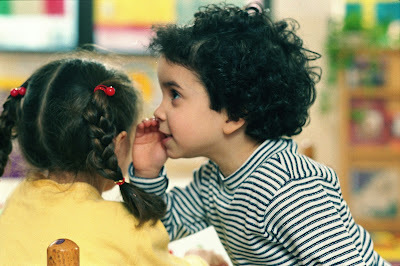 The first facts is common sensical, but I will write it here anyways :) Positive reactions and encouragement of the first attempts of talking influence the child's language trajectory. Behaviorist theory suggests that language, as other aspects of human development is absorbed by children through operant conditioning, meaning that certain actions and behaviors are enforced by giving a reward. For example a parents reaction to a child babbling may determine the shape of his futures sounds. Parents may reward children with attention, a positive comment, a smile or a touch and the child will be more likely to repeat the sound. "Baby talk" also known as "motherese" or "parentese" helps babies pay closer attention to speech against background noise and puts emphasis on the important words or structures. Children will learn how to talk by themselves with no formal education provided they are a part of society and they get plenty of social interactions. Chomsky's Language Acquisition Device is a theory which refers to the innate and universal ability of children to absorb and process language from his/her environment. This device may explain why children across cultures go through the same stages of language development. For example a child in Spain may invent the Spanish version of "runned". Should the social interaction lack, language development, especially after 5 is more difficult and less successful. The are two theories which seem to support this: Critical Period Hypothesis, which is based on studies of feral children and suggests that 0-5 is critical to acquiring the language skills a human being needs to properly function in society. The second one, Social Interactionist theory, explains how language developed focusing on the interactions between the child and adult, as a partnership between a beginner and someone who is more competent. As the child develops and makes new discoveries, so does the need to share these discoveries grows, the child turning towards those close trusted adults around him. This is how the social aspect impacts the development of language. The lack of socialization in the first years of life can severely damage a child's brain and consequently his/her language acquisition. For young children up to five learning to speak two or three languages at once is as easy as learning just one, provided the necessary exposure. Bilingual children have the same milestones in language development and have a deeper understanding of language in comparison to monolingual children. Most speech delays can recovered until de age of seven. However, they can cause harm to the social or emotional development. Here is a list of signs of language delay put together by the Canadian Hanen Center. Parents and teacher should have in mind that speech delays are not the same as language delays! I recommend watching this amazing TED Talk by Patricia Kuhl, which will shed more light on the internal mechanisms of language development in babies! US National Institutes of Health, (2010) Toddler development [online] available at: http://www.nlm.nih.gov/medlineplus/ency/article/002010.htm (date accessed 5/10/13).